Sgt. Welton Simpson Jr. drives his police SUV through the Boyd-Booth neighborhood in Southwest Baltimore. The area has long been one of the most impoverished and segregated parts of town. For years, officials all but gave up on it. But today, the streets look a little cleaner. Fewer weeds are threatening to take over. More lights are fixed. Simpson passes a corner that was once a hub for drug dealing. It's all clear. "Our increased patrols seem to have reduced the trafficking that was going on," he says. "For the most part, it's working." In Baltimore's most crime-ridden zones, city officials are conducting an experiment in government. They started last year by targeting four small, deeply troubled areas to be flooded with more police patrols and city services. They called them "Transformation Zones," at first, then rebranded them as "Violence Reduction Zones." They've since added three more zones, bringing the total to seven. Each zone gets several dedicated police officers, called Neighborhood Coordination Officers, and an extra focus across city government for ramped-up services. Mayor Catherine Pugh has put $1.6 million in the city's budget for two "rapid response" crews from the Department of Public Works to quickly clean up these areas, three more housing inspectors to enforce code violations such as peeling lead paint and extend hours at local recreation centers. The idea is simple: If it can be rightly said that these areas were for far too long over-policed and under-served - and if this punitive style of government did not produce lasting crime declines - then officials should try the opposite: The zones should be drowning in services, from job training to street cleaning. 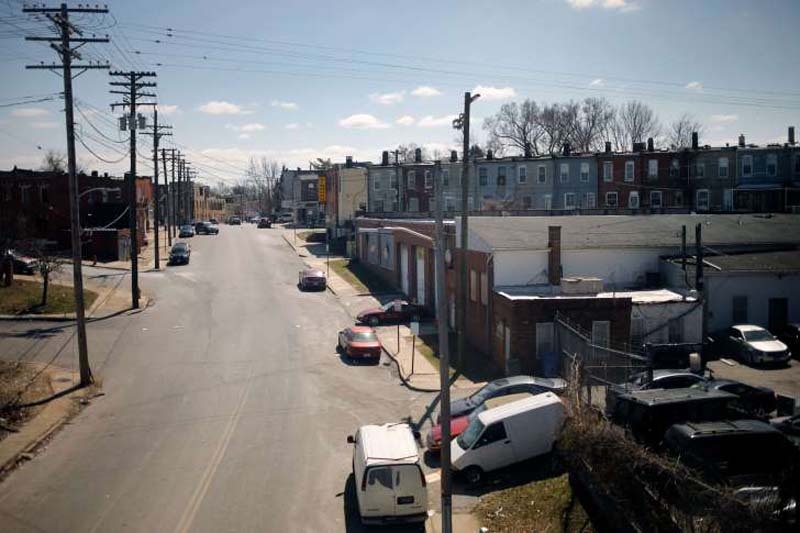 And if the approach can improve the most neglected parts of Baltimore, the theory goes, officials should be able to create a domino effect that will spread the transformation outward to neighboring areas, and eventually the city as a whole. "If you can drive crime down in the most violent areas," Pugh says, "you can drive down crime all over the city." But there's a concern. As police and politicians increase patrols and offer more needle exchanges and rec center programs, they acknowledge, some of the crime they're suppressing is simply moving to other parts of the city. Simpson - a combat veteran who served in Iraq - looks out at the corner of Hollins and Payson streets. "They wanted us to deal with the open-air drug markets. We jumped in feet first and started dealing with that," he says. "The drug operation that was operating there, they're completely shut down. They've moved to another part of the city. "I know where they're at. I let people know this is where they are now, but they're not at Holllins and Payson. We pushed them out." Inside the seven zones, homicides are down by about 30 percent from the same period last year. And data collected by the city's revamped CitiStat office - now called the Office of Sustainable Solutions - show services in the seven zones have increased, in some cases dramatically. It used to take nearly three weeks to get a clean-up crew to a site after a dumping in Baltimore's poorest neighborhoods. Now it takes about two days. The time it took to remove abandoned vehicles and fix broken street lights in these zones has been cut in half. City officials say they've performed nearly 10,000 visits to check on the fire safety of homes in these areas, contacted nearly 4,000 residents about jobs, and conducted nearly 3,000 needle exchanges since the end of last year. Pugh describes the strategy as a "hyper focus" on the most historically neglected parts of Baltimore. She says government is bringing the "same type of urgency" to entrenched problems as it typically reserves for natural disasters. Crime has begun to decline across Baltimore, but less dramatically than in the zones. Violent crime citywide is down 20 percent this year, a welcome improvement after three years in which murders topped 300 annually. Pugh credits the Violence Reduction Zones, new Police Commissioner Darryl De Sousa's "blitz" strategy and community-led anti-violence efforts such as the Ceasefire movement. "We believe all of that working together certainly did have a contribution," Pugh says. "The issue is making sure it doesn't spill over into other areas. ... What we don't want is for it to spill over into other areas." The city launched the first zones in early 2017 under former Police Commissioner Kevin Davis. But Pugh says they didn't receive the support they needed to be successful until November, when she ordered the leaders of 30 city agencies to begin meeting at police headquarters every morning to strategize ways to drive down crime in the zones. That's when the Transformation Zones began Violence Reduction Zones. "There are issues that the police department faces when you're trying to deal with violence," the mayor says. "You might be trying to get to an alley. The alley is filled with trash. You know where drugs are being distributed. You know where the troubled businesses are. You're coming up on streets that are very dark." On a recent Friday, crews from the departments of public works and housing swarmed the 1500 block of Traction Street in West Baltimore, a part of town that looked more like a landfill than a neighborhood. The workers boarded up vacant buildings, painted over graffiti and hauled away huge piles of trash that had built up for months - leaving the block in noticeably better shape for its homeowners, and in less than an hour. John Chalmers, the West Baltimore man who heads the city's Bureau of Solid Waste, says crews have closed out more than 12,000 service requests since November, knocking down the average wait time from weeks to under two days By sending out multiple crews at the same time, he says, they can have a bigger effect transforming a neighborhood. "It helps to rejuvenate the residents," he says. "When they see this amount of resources in a high-crime area like this, it helps to bring them back. They left this morning, they come back this afternoon and they see all the debris gone. That's how you get the citizens to buy back in." Lawrence Brown, an assistant professor at Morgan State University who studies how racism affects public health, says he wonders about the true motivation behind the zones: Is the approach to help residents, or developers planning projects in those areas? Brown notes the effort is relatively small. Pugh's budget this year, for instance, contained more than $500 million for policing, and funding for law enforcement increased more than any other aspect of government. "Things that may benefit a community initially may end up benefiting developers more in the long run," Brown says. "This small effort is taking place without a larger strategy to address systemic oppression in black areas. If it was backed up with more systemic ways of undoing oppression, I would feel more comfortable. I'm leery of a piecemeal approach, knowing developers are eyeing these areas." But Nancy McCormick, president of the Mount Clare Community Council, says she's seen improvements in her neighborhood since the effort began. McCormick, 77, says she watched for decades as Mount Clare deteriorated in slow motion. "We have a lot of drug activities and prostitution." But she says the new strategy has given her some hope. She's noticed improved services coming from City Hall. After years of complaints about trash piling up in alleys in the neighborhood, a city crew recently came and hauled away all the garbage in the 400 block of S. Gilmor Street. "They were going with garbage cans down the alley and actually cleaning the whole alley," she says. "I told my husband I was about to faint. That was a first for the neighborhood. ... They were out around Cole Street. They were cleaning alleys over there. They've been doing a lot of cleaning, which is surprising." Police, meanwhile, have "gotten a lot of guns and drugs out off the neighborhood," she says. "The activity has really gone down." Edith Gilliard-Canty, 69, president of the Franklin Square Community Association, has also noticed improvements. But she says the criminal activity has just been just outside the neighborhood. "As for our neighborhood and what I see, I don't see a whole lot happening in our community like in other communities," she says. "Everything is happening around our boundaries." Gilliard-Canty says the neighborhood has suffered drug dealing and shootings for years. While she's appreciative of the city's efforts to encourage drug dealers to leave the profession for legal work, she believes few will take the offer. Most, she believes, will just move to other parts of Baltimore. "Yes, they are offering a lot of services. You can't blame the city for not trying," she says. "But they can go outside and throw 1,000 fliers on top of the guys standing the corner and it won't do a thing. These are the services the city is offering, but maybe only one of them are picking up on them. "We can't blame the city for what people won't do." A team from the Bloomberg Harvard City Leadership Initiative visited Baltimore in January to begin studying the effort. More robust research is set to begin later this year. A spokesman for Harvard said the study will be made available once it's completed. City Council President Bernard C. "Jack" Young says he hears fewer complaints from within the zones. "Where I used to get calls about crime and drug dealing on the corners, I don't get those calls as much anymore," Young says. "When I go to community meetings, I don't hear that. We still have too much crime. But I think this coordinated effort is working." De Sousa, who replaced Davis in January, says initial success in the first four zones led officials to expand to seven: Two in West Baltimore, two in East Baltimore and one each in Park Heights, the Southwest Tri-District and Northeast Baltimore. While most of these spots have long been hotbeds in crime - and virtually ignored for city investment - the Northeast Zone is an area where crime had recently started to creep up. De Sousa says city officials decided to target that zone after a crime spike. "We took all the members of the Violence Reduction Initiative to Belair Road," De Sousa says. "The day before there was a young man who had been murdered. He died lying in trash. We knew there was a need to add a zone in the Northeast." De Sousa hopes the city adds more zones in future months. But he's mindful of the potential of pushing crime into other parts of Baltimore. He says he knows of only a "handful" of clear cases of what city officials call "displacement" - instances in which someone committing crimes in a zone was pushed out and began committing them outside the zone. "We are not neglecting other parts of the city," he says. "We specifically talk about displacement. That is a concern. Police commanders have a conversation about what's happening outside the zone, what kind of arrests are made outside of the zone. It's a tough challenge." But after decades of a police-heavy focus on Baltimore's poorest ZIP codes, he says, a new approach is worth a try. "When there is a conversation about over-policing certain communities and under-serving them, I think we're flipping that," he says. City Councilman Brandon Scott, chairman of the council's public safety committee, began raising the issue of displacement last year. He noted that many more murders were occurring outside of the zones than inside. During a council hearing last summer, Scott pointedly questioned police commanders over why more than 90 percent of murders were occurring outside the zones. "We know their zones are being successful because there's less violence there, but clearly it's going to someplace else," he says. "We can see there's displacement. They can't just celebrate these zones while everything is going crazy everywhere else. Smart criminals are going to relocate." Scott says he believes the service-heavy strategy works best when the politicians get out of the way and let agency workers on the ground coordinate responses to problems quickly. "The entire city should operate like that," he says. At a recent 8 a.m. meeting led by Pugh at police headquarters, top city officials ticked off a list of accomplishments in the zones, such as how long each zone had gone without criminality activity. They also discussed enhancing lighting and targeting problem businesses, for more gains. A report from an East Baltimore zone said there had been no violence within the last 48 hours and police had disrupted a drug operation. City workers said they were close to figuring out who was dumping trash at Old Town Mall. A similar report from the Northwest Zone said there had been "no acts of violence in the VRI." The report from a West Baltimore zone was straightforward: "No shootings in the VRI in the past 24 hours." Pugh urged police to look for drug dealing inside West Baltimore liquor stores. She had visited one, she said, and believed dealers had moved inside with the tacit approval of the business owners. "You don't see them on the corners much any more," the mayor said. "There was a man in a wheelchair with money on his lap. I don't think he was buying anything." A liquor board inspector told her they would plan covert operations in the area. Simpson was joined on patrol in the Southwest Tri-District zone by Det. Ryan Perry and Officer Joy Pegeus to form a three-member team that performs extra policing in the area. Their job is to drive down crime, but also serve as ambassadors from the city to the neighborhood. Simpson says the officers act as the eyes and earns of city government, calling in street light outages, blocks in which there's a need to create open space, and traffic patterns that should be altered. Perry teaches an anti-drug DARE class in one of the schools in the zone. Pegeus says she has a passion for working with young women to get them out of a life of prostitution and drugs. The officers "are doing everything you can think of across the board," Simpson says. "We already know we can't arrest our way out of this problem, so we had to come up with new creative ways to deal with the issue." Simpson says he used to attend City Hall meetings about bringing services to the zones. But he realized it was easier to coordinate directly with workers on the ground from four agencies: the fire department, public works, transportation and health. The officers talk about the violent crime spike of the last three years. It followed the April 2015 death of Freddie Gray in police custody, the rioting and charges against six officers. They're hopeful their new approach can turn things around. "Maybe morale isn't where it should be," Simpson says. "Maybe officers aren't as proactive as they should be because they feel they don't have the support of the public. Right after the riots, people who were involved in criminal activity believed they could do what ever they wanted to do." Forty of the students at Steuart Hill Academy, the school where Perry teaches DARE, are homeless.The officers reserve food baskets for them at Thanksgiving. "I believe the police have to work to earn the people's trust," Simpson says. "I believe it starts with those kids. When Perry saw the opportunity to teach DARE, I brought that to the major. We're in that school. Now they know us. They like us." On their patrols, the officers pass some of the most dilapidated blocks in Baltimore, places abandoned so long ago that trees now grow out of the buildings. Simpson says the officers often find drug-addicted people hanging out in the vacant homes. They usually need some form of help. In a previous era, police might have locked them up for drug possession, or trespassing. But the officers now try a different approach. "When we see people in the vacants, we try to offer them any services we can," Simpson says. "It forces officers to do something different than just arrest people, when they may just be trying to get warm."